(CNN) -- The United States is looking for opportunities for "face-to-face" dialogue with Iran after nearly three decades without diplomatic ties, President Barack Obama said Monday, but still has "deep concerns" about Tehran's actions. 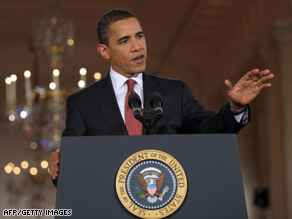 U.S. President Barack Obama answers a question during a press conference on Monday. "There's been a lot of mistrust built up over the years, so it's not going to happen overnight," Obama said during his first prime-time news conference Monday night. He said his administration is reviewing existing U.S. policy toward Iran, which supports groups Washington has branded terrorist organizations and has defied U.N. demands to halt its uranium enrichment program. Despite those concerns, he said his administration wants to use "all the resources at the United States' disposal" to resolve those concerns. "In the coming months, we will be looking for openings that can be created where we can start sitting across the table face to face," Obama said. Speaking on other foreign policy issues, Obama said he does not yet have a timetable for withdrawing troops from Afghanistan. He said that, unlike in Iraq, there is not the sense that the political system in Afghanistan is functioning in a meaningful way. "They've got elections coming up, but effectively the national government seems very detached from what's going on in the surrounding community," Obama said. He said that, in addition, there hasn't been concerted effort to root out the Taliban and al Qaeda from their safe havens in the border regions between Afghanistan and Pakistan, which is necessary for success. "I do not have yet a timetable for how long that's going to take. What I know is I'm not going to make -- I'm not going to allow al Qaeda or (Osama) bin Laden to operate with impunity, planning attacks on the U.S. homeland." Obama said the administration will seek Pakistan's cooperation to root out the border safe havens and stressed the importance of ensuring Pakistan is a stalwart ally in fighting this threat. On the issue of nuclear proliferation, Obama said it was important for the United States, in concert with Russia, to lead the way. He said he has expressed to Russian President Dmitry Medvedev the importance of restarting conversations about reducing each others' nuclear arsenals and stitching back together nonproliferation treaties which he said have been weakened over the last few years.